Teachers who worked at a college which closed two campuses, one of them brand new, after racking up £25m of debt have said no-one has been held to account. Central Sussex College had taken on £30m in mortgages before closing sites in East Grinstead and Haywards Heath. Ex-teacher Jonathan Goodwin claimed debts were mismanaged and the local MP said there was a "governance failure". The BBC tried to contact the former principal of Central Sussex College Sarah Wright but has had no response. However, in 2016 Ms Wright said the college's debts were too high and it had to reduce its costs. Ms Wright, who had joined the college in 2013, said decisions were taken between 2008 and 2011 which saw the college take on mortgages worth £30m. She said it then borrowed government money in 2013 to keep running but the financial situation was a "significant, ongoing struggle". 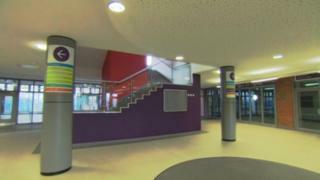 Mr Goodwin described the Haywards Heath campus as "a state-of-the-art building, one of the best". He said: "In business it would never have been allowed to happen - so why was it allowed to happen within the education sector?" Sir Nicholas Soames, Mid-Sussex MP, said: "There was a governance failure, but at no stage was I ever told of the seriousness of the financial position." The Haywards Heath campus shut its doors in 2017, a year after the closures were announced. The site has remained closed since then with tables and chairs removed and most equipment gone. A security guard has remained on site and the car park has been rented out. In 2017, Central Sussex College was renamed Crawley College after it merged with Chichester College. More than 20 organisations then competed for the job of bringing the closed campus back into use and Chichester College Group was selected for the project in December 2018 with a view to reopening the site from 2020. Chief executive of the Chichester College Group Shelagh Legrave would not comment on what happened before the merger. A Department for Education spokesperson said: "We are working with the college and local stakeholders with the intention of opening the site as part of the Chichester College Group in September 2020. "The Chichester College Group was chosen after a competitive process concluded in December 2018 to select a high quality, existing provider to expand and take on the Haywards Heath site."